The ultimate in quality optics and binoculars, Carl Zeiss was founded over 150 years ago in 1846 and to this day maintain the very highest standards. Headquartered in Oberkochen, Germany, in northeastern Baden-Wurttemberg, with production centers in Europe, North America, Central America, and Asia, and offices in over 30 countries, make no mistake, Carl Zeiss Binoculars are of the highest quality. As well as binoculars, Carl Zeiss manufacture the rifle scopes, eyeglass lenses, camera and cine lenses, microscopes and optronics. Hollywood blockbusters like "Lord of the Rings" have been shot through Carl Zeiss objective lenses and the Ferrari Formula 1 team uses Carl Zeiss technologies to ensure the quality of its racing car transmission systems and bodywork. Carl Zeiss Binoculars pride themselves on the highest quality as well as innovation, examples of this include the special fluoride glass lenses found on the Victory FL binoculars and the newer Victory HT binoculars. These lenses contain fluorine ions that contribute to a further considerable improvement in image quality. Another example of innovation are the Victory RF Rangefinder Binoculars that display the distance to the object you are viewing with the press of a button. Most binoculars in the Zeiss range feature fully multi-coated optics, water-repelling coatings, phase-coated prisms, twist-up eyecups, diopter control, and ergonomic focus. 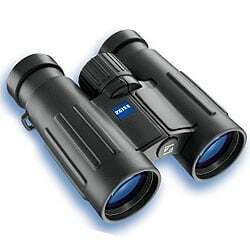 The high-end Zeiss binoculars are water proof and nitrogen-purged to ensure that no internal fogging occurs. There are two main ranges produced by Zeiss binoculars, The Victory range is their top of the range binoculars and offer what they call "state of the art" performance with superior views and handling. And the Zeiss Conquest series, their "superior value" range that still maintains the highest Zeiss standards, but at a cheaper price level than the Victory series. Zeiss describe their VICTORY HT Line of Binoculars as "Ground breaking" and even go as far as to say that the VICTORY HT is the brightest super-premium binocular in the world! Zeiss like most other premium optics manufacturers use a number of coatings and other technologies to help ensure that as much of the light that enters the binoculars get to your eyes, but a small percentage of light loss through absorption as the light passed through the glass was accepted as inevitable. What is special and new with the Victory HT is that they use new HT lenses by SCHOTT that they say now helps to ensure that these optics have a transmittance level of more than 95%. Fluoride Lenses: The lenses also contain fluorine ions that contribute to a further improvement in image sharpness and color correction. T* coatings: The Carl Zeiss T* multi-layer coatings are their own anti-reflection coatings that cover the surface of the lenses. LotuTec coatings: The Zeiss LotuTec coatings are water-resistant and have hydrophobic qualities. They are applied to the external lenses of the ZEISS Victory HT binoculars and help ensure that any water rolls off the glass straight away without leaving any residue and that dirt and fingerprints do not stick to the lens. Abbe-Konig-prism System: These ZEISS binoculars come with large Abbe-Konig roof prisms, which work without light-absorbing mirrors and are the brightest roof prism system available. Weighing just 785g and with a 5.3 mm exit pupil diameter, a nice wide field of view and 8x magnification, these binoculars are perfectly suited for a wide range of different uses. The vastly superior transmission levels deliver very bright images even in very poor light conditions. This means that you can go on watching for longer, until deep into the twilight. Just slightly heavier than the 8x42 Victory HT, the 10x42 version is ideal for slightly longer distance observation and yet it still has a nice wide field of view for a binocular with a 10x magnification. Made in Germany and with the body and the optics based on the top of the range Victory HT (see above), combined with a very high calibre laser rangefinder, the series of Zeiss Victory RF binoculars are not only designed with hunters and hunting in mind, but are designed to match or indeed beat any other laser rangefinding binocular on the market. Currently these are available in for different configurations. The popular 8x42 and 10x42 versions for general use hunting and then the large aperture 8x54 and 10x54 models that are specifically aimed at outperforming the competition in very low light situations. Zeiss has chosen to use their very best Fluoride Glass lenses, which are considered by many to be amongst, if not the very best available. The entire optical system is also multi-coated with six layers of their Carl Zeiss T* material to further increase light transmission and reduce undesired reflections. Abbe-Konig prisms are used, which are essentially one of the types of roof prisms. They also phase corrected and as with all their top end instruments. The external lenses are treated with their LotuTec material, that repels water and makes them easier to clean. 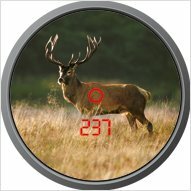 Extremely powerful, the laser rangefinder is rated as having a maximum range of 2, 500 yards (2300meters), which equals or indeed beats just about any other option currently on the market. However keep in mind that this quoted range (and indeed that of all other laser rangefinders) will be under ideal conditions and changes depending on the reflectivity and size of the object that you are aiming at and the weather. The LED display will automatically adjust in brightness depending on how much light is available, or you can adjust it yourself, ensuring that you are always presented with the information you need in the best and easiest to read way. The onboard computer has air pressure and temperature sensors and will take these into account as well as things like the angle to the target when working out the ballistics for you. What is more, you can save up to 9 different profiles for quick and easy access, no matter which weapon you decide to take on your hunt. The laser rangefinder works off a single CR2 battery, the compartment to which is located on the front hinge. I like that fact that you can make changes to the settings using just one hand. This is important as most hunters often like to use their other hand to keep hold of their weapon for quick firing after using their optics. The Zeiss RF binoculars share the same double-link bridge design as that of the HT series, which not only adds to their strength, ensuring that the lenses do not go out of alignment, but still leave much of the barrels free for you to grasp onto, for a better grip. Like most top end binos, the chassis is made from a magnesium alloy, the properties of which strike a great balance between weight, strength and resistance to expansion and contractions due to temperature changes. As is usual, the outer surface has a rubber armor. This adds grip and protection, but also improves camouflage when compared to a hard material by making the instrument less reflective and by buffering sound. The focus wheels is positioned within the two bridges and these ranger binoculars come with twist-up eyecups and a diopter that can be adjusted by ± 3 dpt. These binoculars are fully sealed and filled with nitrogen to prevent fogging. Not simply "waterproof", Zeiss quantifies this by stating that they have a water resistance of 400 mbar, which basically means that they can be fully submerged to a depth of 4 meters for 2 hours without problems. The combination of the very best precision German made optics and their world famous expertise with a powerful and accurate laser rangefinder results in a series of ranging binoculars specifically designed for hunting that are amongst the very best. 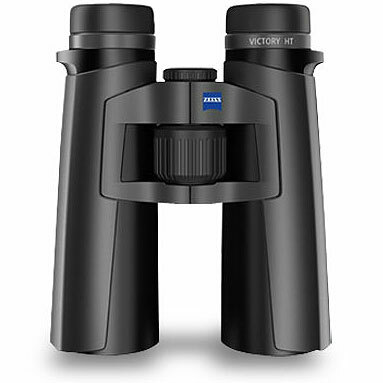 All the binoculars in the Zeiss Victory range feature their Water and oil repelling protective coating called LotuTech® and all except the compact 8x20 and 10x25 binoculars feature the Zeiss Fluoride glass (FL) which is said to offer outstanding edge definition and minimal color fringing. Compact pocket binoculars for hiking and mountain climbing, operas and concerts. Compact pocket binoculars for nature observation, holidays and traveling. Binoculars bright enough for all occasions. Ideally suited for stalking and field ornithology. Excellent performance even in the twilight hours. 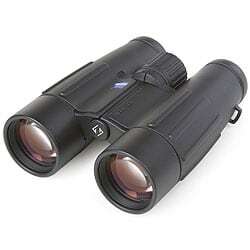 Ideally suited for mobile hunting, wildlife observation and birding. Discover fine details with brilliant purity and razor sharp clarity both in the distance and at close range. The traditional pair of binoculars for hunters. Reliable binoculars from dawn to the poorest twilight. Most powerful binocular within the modern FL series. So what do all the letters mean? 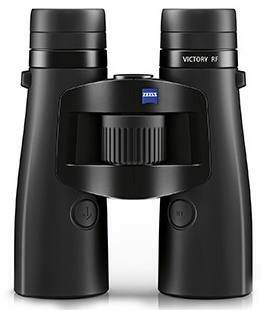 The Zeiss Victory FL series of binoculars all contain the Zeiss Fluoride glass (FL) which help keep the edge definition of the image sharp with minimal color fringing. If you take a look at the features and descriptions of most Zeiss binoculars, they will mention T* and P*, so what does this mean? They stand for Zeiss' two proprietary anti-reflective coatings are called T* and MC multi coating and an additional Zeiss-exclusive coating called P* which stands for Phase Correction Coating, which is applied to Roof Prisms to correct color fringing. These coatings are there to limit the small percentage of light that is reflected away when it hits the glass surface of the optics and thus does not enter the binoculars and then your eyes. The glass surfaces are treated with a microscopic layer of refractive material, such as magnesium fluoride. To achieve this multi coating, several such refractive layers are applied, when this is done correctly these coatings can dramatically enhance light transmission properties of the binoculars by delivering more of the available light to the eyes. Some of the most innovative series of binoculars in the Zeiss Range are the Victory Range Finder Binoculars, designed specifically for hunting. The two models in this series, the Zeiss Victory 8 x 45 T* RF and Victory 10 x 45 T* RF come with very bright and powerful optics, but also include LED displays within the view that, with a press of a button on the binoculars will display the precise distance to the object you are viewing along with their integrated BIS™ ballistic information system. Additional important features include ease of use and an informative, uncluttered display concept - all in an ergonomic design for comfortable handling. Eagle Optics currently have a whole bunch of Ex-Demo and Factory refurbished Carl Zeiss Binoculars in stock where the savings on the standard new price is huge. They are well worth checking out if you fancy enjoying the legendary Zeiss brightness without paying full price!